Today is National Diabetes Alert Day–a day to ask the American public to take the Diabetes Risk Test, which checks for the development of type 2 diabetes. Also, it’s a good day to be aware of all the factors that put Americans at risk for diabetes, including weight, age and family history. With that being said, it’s a good idea to know if your pet is at risk for diabetes too. Pets that are overweight and those that eat a high carbohydrate diet have the highest risk of developing diabetes. 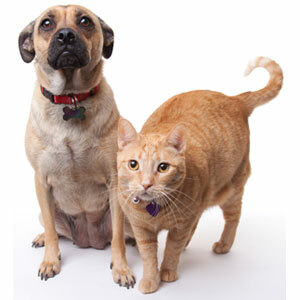 Furthermore, female dogs and male cats are known to develop diabetes over their counterpart. What are the symptoms of pet diabetes? For all signs and symptoms of diabetes in pets, click here. Your dog’s or cat’s veterinarian may prescribe an insulin medication. Common medications like Novolin N Insulin and ProZinc Cat Insulin help to control your pet’s blood sugar levels and therefore reduce the symptoms of diabetes. A balanced diet is one of the best ways to help a pet with diabetes. Pet’s with diabetes benefit from eating a high-protein diet and low glycemic carbohydrates. In addition, eating at the same time each day helps to control blood sugar levels. For cats with diabetes, dry food and zero carbohydrates are recommended. That means high-protein canned food, or maybe even a raw diet may be right for your kitty. For both dogs and cats, it’s recommended limit the amount of treats you give your pet, as too many can cause blood sugar spikes. If you have noticed any of the diabetes symptoms above, contact your vet to get a thorough diagnosis and find out the right course of action for your pet.